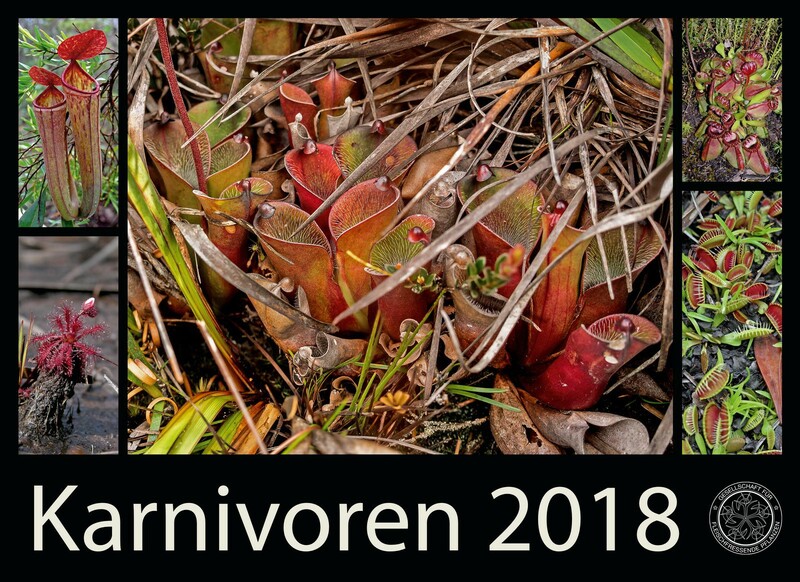 the new carnivorous plants calendar of the GFP will soon be ready to be shipped. You can now order your copies. The calendar contains more than 50 pictures. You will find a detailed description for each picture on the rear site of the cover. It has a wire-O-binding to hang it on the wall, and a transparent plastic cover right in the front. The calendar is in landscape format (44 x 32cm). It contains all German nationwide holidays. As we had a great response last year we now increased the number of copies to 250. We would be really happy if we could sell them all again! Please do not hesitate too long and order your copy very soon to make sure you get one. The price for one copy will be 15€ + shipping. Outside Germany: each calendar 8€. Please ask for shipping if you want to order more than one as the prices vary greatly depending on the country you are living in. We would like to thank everyone who has given us permission to use the pictures. Such a project would not be possible without your pictures! It is very important to see that there is an interest in them. You keep the project alive by believing in our work and therefore maintaining interest in the calendar. Just imagine, that's the 11th birthday of our GFP calendar. That's huge!